Super yummy and so easy to whip together for a summer BBQ. Whisk vanilla pudding packet, ½ cup milk and cool whip together until well combined. Chop up apples into bite size pieces. Stir chopped apples and Snickers into pudding mixture. 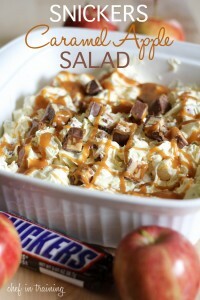 Place in a large bowl and drizzle with caramel ice cream topping.